This morning, Capcom announced details of the first Sengoku Basara 4 merchandise to be released outside of a special event. 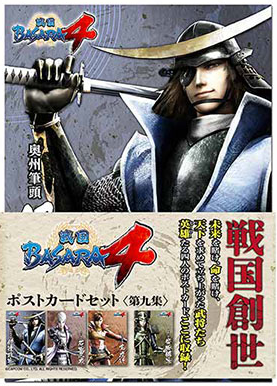 An official Sengoku Basara 4 2014 calendar will be made available on 1st October 2013 priced at ¥2,100. A preview image of Masamune's page was shown on the website, however I can't help but think that there are twelve months (the listing actually says there will be thirteen pages) plus the cover, which is likely to be the existing group shot. Only eight characters have been announced so far. Is that a hint that we'll get five new characters revealed by the start of October to fill the remaining pages? The listing promises that there will be more information later on about the designs which the calendar will include. There's potential for speculation since I imagine that the calendar will sell better if the characters featured inside it have a lot of fans; I think it's likely we'll see some popular characters revealed in the next few announcements. 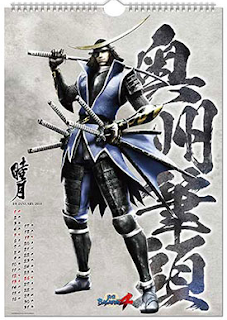 Accompanying the calendar is the ninth Sengoku Basara postcard set priced at ¥525. It will be released on the same day and contain just four postcards: Masamune, Mitsunari, Sakon and Katsuie. Sengoku Basara producer Kobayashi 'KobaP' Hiroyuki presented his promised 'talk show' and autograph session at Capcom's Summer Festival in Huis Ten Bosch event on Sunday 4th August 2013. Only fifty fans were able to attend, so naturally there isn't very much coverage online. Famitsu has posted an event report for the rest of us, revealing that much of the discussion was actually about Biohazard (Resident Evil). While there weren't many points in the report which qualify as Sengoku Basara 4 coverage, KobaP said that they picked the 'Sengoku Creation' theme so that newcomers to the series could enjoy it properly without prior knowledge of the older games, and that there would be 'many' new characters joining the fray aside from Katsuie, Sakon and Shikanosuke. He also spoke about the early days of the series and the way it's expanded across different media. In other words, it doesn't look as though he said anything that we didn't already know! One advantage of KobaP's trip is that he drew attention to the special themed Capcom menu on offer at the resort, including two Sengoku Basara shaved ice dishes: Date Masamune's 'So Cool!!' kakigoori and Sanada Yukimura's 'Tagiru Karada No Ikinuki' kakigoori. They cost ¥500 each. JTB are planning to host the fifth official Sengoku Basara bus tour with visits to historical sites. This time it will be an overnight trip covering sites related to Date Masamune and Katakura Kojuurou, so it's been titled the 'Sengoku Basara Dategun Tour 2013'. The tour bus will depart from Shiroishi Zaou station (pictures) on 5th October 2013, taking guests to sites associated with the real-life Kojuurou and the sixth Oni Kojuurou festival. The next day will be devoted to the real-life Masamune with visits to Matsushima, Zuihouden (pictures) and the Sendai City Museum, which is displaying Masamune's black-laquered Kurourushi Gomai Dougusoku armour set for a limited time. Guests will spend the night at the Sendai Akiu Spa Hotel Sakan, a thousand-year-old inn where Date Masamune once stayed. KobaP will be going on the trip as well and after dinner he'll present a Sengoku Basara lecture. Although fan club members will be given priority and allowed to book their tickets from the end of this week, general applicants have to wait until 23rd August to apply. The cost of the tour is ¥44,100.